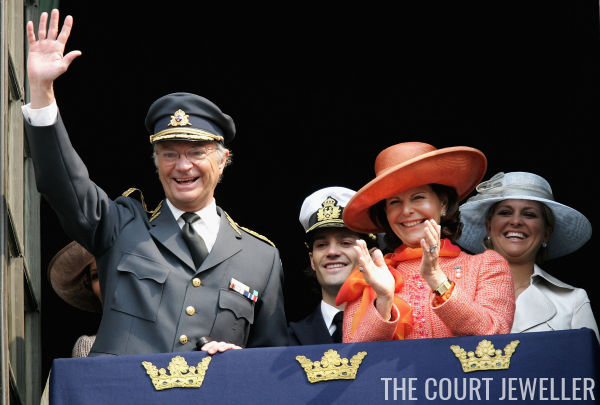 To continue our look back at the jewels worn during the 60th birthday celebrations for King Carl XVI Gustaf of Sweden, we're flashing back to the daytime events from the king's birthday, including a balcony appearance and a luncheon at city hall. 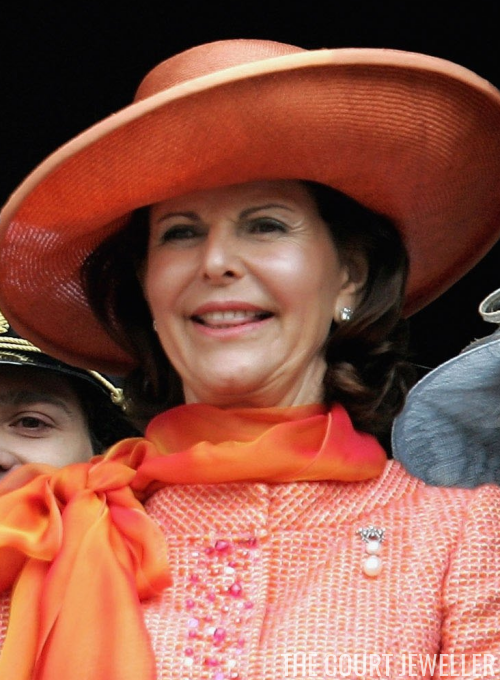 Queen Silvia wore diamond stud earrings with a lovely, petite diamond and pearl brooch. 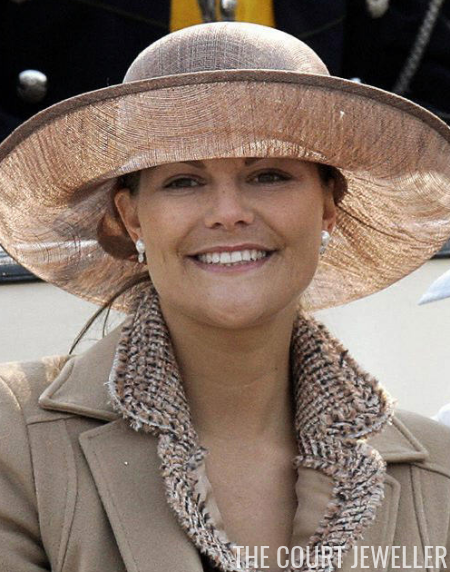 Crown Princess Victoria also wore pearls: a pair of pearl earrings. And Princess Lilian joined in with the pearl parade as well. Above, you can also see a fairly clear view of Princess Madeleine's necklace, which has a pale blue pendant stone -- possibly an aquamarine? Madeleine also wore a pair of chunky gem-set hoop earrings. 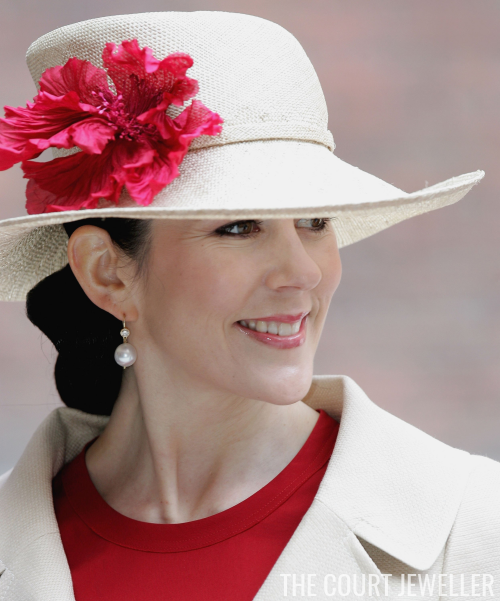 Crown Princess Mary wore a pair of round pearl drop earrings that also feature a small faceted gemstone, possibly a small diamond. 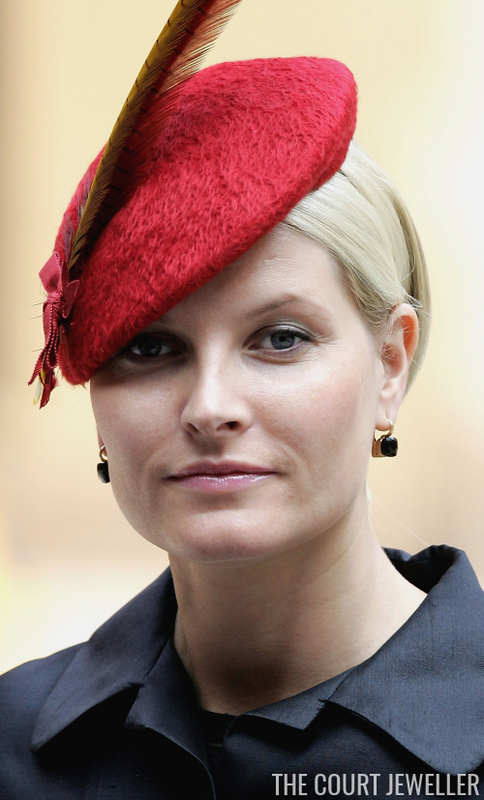 I can't be certain, but Crown Princess Mette-Marit's earrings from the luncheon greatly resemble the style of earring she wore the night before, only shorter. Perhaps these are just the top portion of the other earrings? 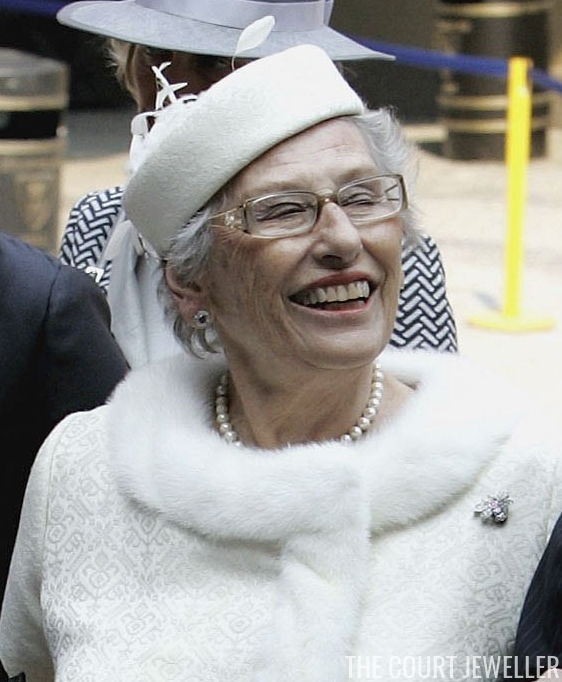 Princess Astrid wore a pearl necklace, earrings set with diamonds and a darker gemstone (sapphires? ), and the most adorable little diamond bee brooch. 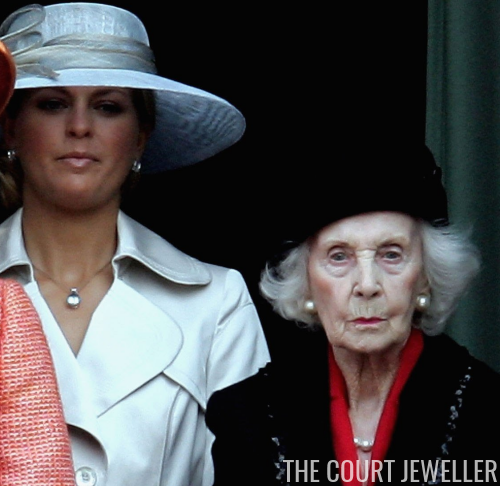 Princess (now Queen) Maxima wore diamond pendant earrings with orange drops. And Marie-Chantal of Greece wore earrings and a long coordinating necklace. The set looks like high-end costume jewelry to me, possibly Chanel or Dior? (She wore the same necklace and earrings at the christening of Prince Christian of Denmark in 2006 and at Queen Margrethe's ruby jubilee in 2012, and she's worn the earrings by themselves at numerous events.) You can also see a glimpse of another silver-toned pendant necklace under her suit jacket.